Location/ Directions: From the East: Take 90 West to the East 9th Street Exit. Make a left onto East 9th Street. Take East 9th Street 1 block to Lakeside Ave. Make a left onto Lakeside Ave. Hotel is 1 block up on the left hand side on 12th and Lakeside. From the West: Take 90 East to the East 9th St. Exit. Take East 9th Street to Lakeside Ave. Make a right onto Lakeside Ave.
About Hotel: 17-Stories, 379-Rooms, Interior Corridors, 24 hr Pavilion Pantry Market, Business Center, Automated Teller (ATM), Bar Area, Elevators, Coin Laundry, Laundry/Valet Service, Lounge, Multi-Lingual Staff, News Stand, Room Service, Snack Shop, Fitness Room, Pool, Air Conditioning, Clock Radio w/ MP3 Connection, Ergonomic Desk Chair, LCD Flat Panel TV, Coffee Maker, Hairdryer, High Speed Internet-No Charge, Iron/Ironing Board, USA Today® delivered each weekday morning, No Pets Allowed. Railroad View: Excellent. Ask for a room on a high floor on the east side of the building in order to have a railroad view. Railroads past Hotel: Norfolk Southern / Amtrak / RTA Rapid Transit. The railroad is busy, expect abo ut 60 trains a day not counting the RTA Light Rail train that run at a constant pace. Notes: This hotel is in the center of it all! Amtrak / RTA station 2-blocks away. The Rock & Roll Hall of Fame and the stadium are within walking distance. See hotel's web site for details. Photo Comments: The hotel is located right next to the former New York Central Railroad's Water Level Route Mainline. 7 Active tracks are just outside the hotel. Rooms on the east side of the hotel are needed for a view. West side rooms will be blocked by the dark colored building next to the hotel. The hotels parking garage could offer a likely spot for picture taking, however, trees along the railroad will limit railroad photography. Location/ Directions: Interstate 480. Take the Airport Exit and proceed to the hotel. About Hotel: 9-Stories, 287-Rooms, Interior Corridors, Indoor Heated Pool, Indoor Whirlpool, Gift Shop, Self Parking Facilities, Free Airport Pick-Up and Drop-Off (Limited), Shuttle Service within Surrounding Area (Limited), 24-Hour Front Desk, News Stand, Business Center, Laundry Service, Concierge Service, Cable 27" Television with Remote Control, Cribs (Upon Request), Hairdryer, Desk, Cordless Telephone, Room Service, Coffee and Tea Maker, Refrigerator, Iron/Ironing Board, Wake-up Service, Radio/Alarm Clock, Maid Service, High Speed Internet Access, All guest rooms and public spaces are 100% non-smoking, Pets are allowed. Railroads past Hotel: Norfolk Southern / Amtrak / RTA Rapid Transit. 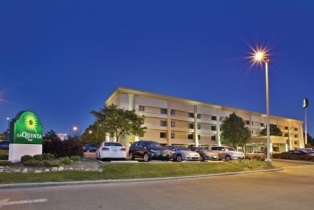 Comments: Hotel is located at the Hopkins International Airport (CLE); this hotel is about a 10-minute drive to one of the east's busiest railfan hot-spots, Berea, Ohio. Photo Comments: Top photo: A view looking east from room # 902 overlooks the parking lo, Berea Freeway, and the Norfolk Southern Chicago Line with a oil train pictured. 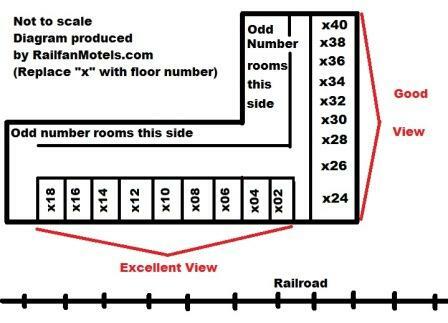 Even numbered rooms that end with 02,04,06,08,10,12,14,16,18 are located on the east side of the hotel, these rooms provide the best railroad view. An Eastbound Norfolk Southern freight passes the Cleveland RTA trainsit rail cars. The RTA looks to run most (if not all trains) as two car sets. The RTA trains ran constant past the hotel. Norfolk Southern runs a good 60 freights a day past the hotel. There was always to something to watch out the window. Another view from room # 902 shows a westbound oil train passing the hotel. The photo was taken with a zoom lens. A north side view from room # 924 shows a eastbound double stack train on its way to downtown Cleveland. North side rooms don't have the excellent view that east side rooms have, but you can see trains well, and see westbounds coming well in advance. Aerial Photo: The hotel is located on the west side of Route 237 (Berea Freeway). The railroad is seen on the east side of the freeway. The closest two tracks that turn under Rt.237 is the RTA Rapid Transit system. The third & fourth are the mainline tracks of Norfolk Southern's former Conrail Chicago Line. Over 60 trains a day operate on this line. A Ford automobile plant is out of view to the right of this picture. About Hotel: 4-Floors, 116-Rooms, Interior Corridors, See above web site for details. Railroad View: Good View. Ask for a high room floor on the front of the hotel, the railroad is just across the parking lot, some trees prevent an excellent view of the railroad. 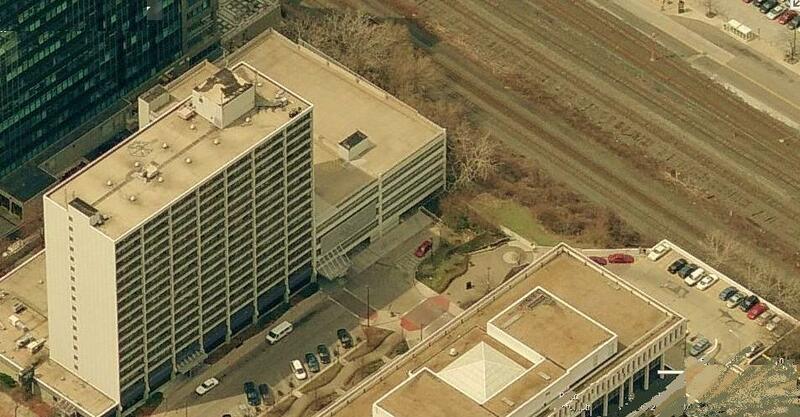 Railroads past Hotel: Norfolk Southern Railway / Amtrak / Greater Cleveland Regional Transit Authority (light rail). Expect around 60 freights during a 24-hour period, 4 Amtrak trains are scheduled during darkness, and RTA trains run several times an hour. Photo Comment: North facing rooms from this hotel will offer a railroad view. Higher floors will keep you above the parking lot. A double stack train is seen in this Google Map Image. 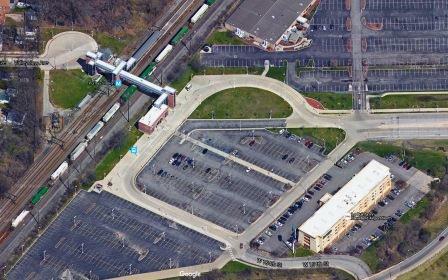 The RTA station can also be seen along the Norfolk Southern line.